This Timer Relay Module is ideal for extending the exit or entry unlock period of a door entry or access control system with just a momentary contact output (closed contact). 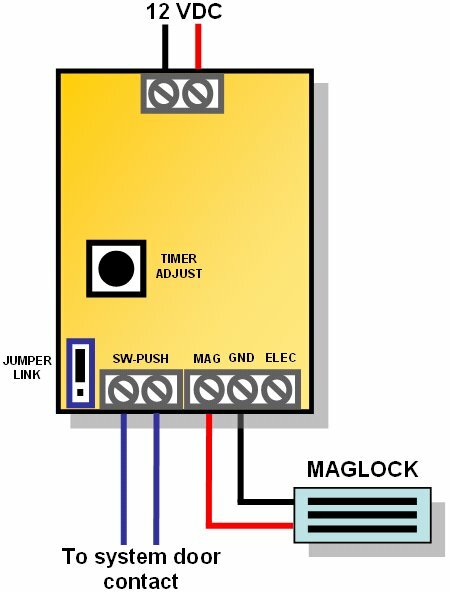 The module will drive a maglock directly from the 12VDC power applied to it and, with the momentary contact output from the system, will provide a defined unlock period from 1 to approximately 25 seconds. The timer operation is easily adjusted using the on-board potentiometer. 12 VDC operation. Please note that the unlock input can only be operated by a voltage-free switch contact.